The Active Link is an innovative new end unit system with an integrated load cell, compatible with the existing range of Modulift spreader beams. It will provide wireless real time data by measuring the load at either end of the spreader beam and is ideal for both weighing and dynamic load monitoring. Data is transmitted wirelessly to a USB transceiver that must be connected to a Windows computer or tablet with a spare USB port. The Active Link, which replaces the standard drop link component, presents a myriad of benefits with time, cost and weight savings all attributable to the fact that measurement technology doesn’t have to be sourced as an additional rigging tool. Another standout feature is that the height of rigging is significantly reduced, especially beneficial in low headroom applications. 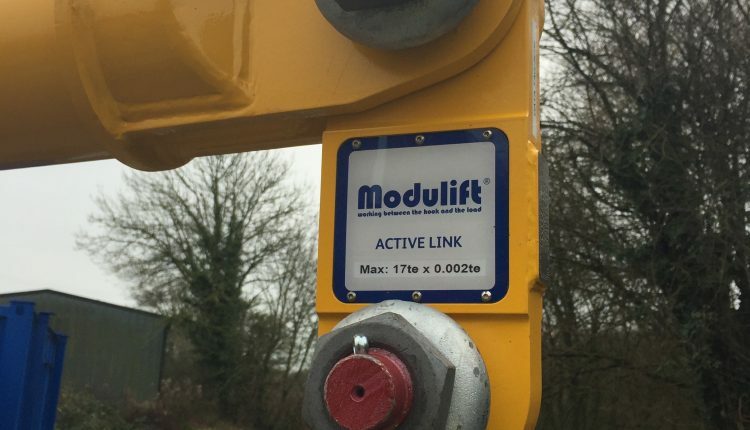 The Active Link is available in a range of capacities up to 100t based on standard Modulift beam sizes from MOD 12 to MOD 70H; the initial range will be AL 12, AL 24, AL 34, AL 50, AL 70 and AL 70H. The new drop links are designed to fit standard end units, as well as the standard top and bottom shackles specified for the spreader. Upon consensus that the Active Link concept was worthy of further exploration, a prototype was designed and extensive tests were subsequently conducted over a six-month period either side of the turn of the year. Modulift is now welcoming orders and enquiries.